Exhibiting the Anthropocene–the proposed geological “age of humans”–is a challenging and risky endeavor. 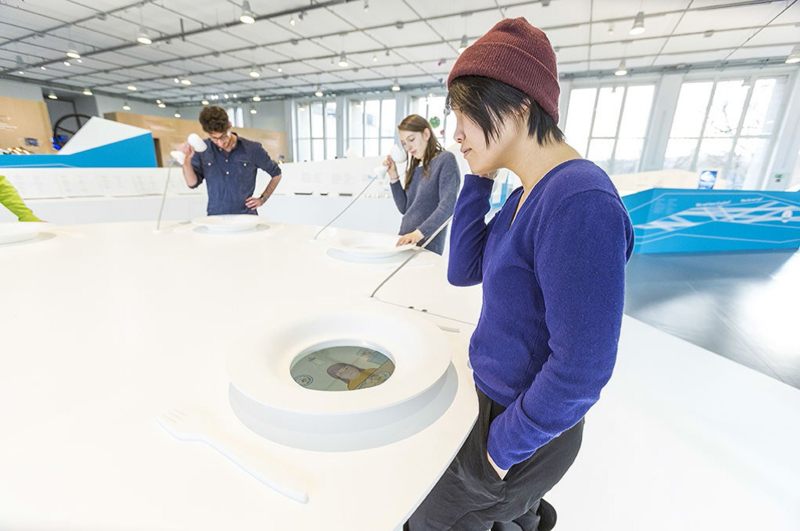 The temporary exhibition “Welcome to the Anthropocene: The Earth in Our Hands,” which opened in December 2014 at the Deutsches Museum as a collaborative project of the museum and the Rachel Carson Center for Environment and Society, is the first exhibition on such a large scale worldwide to tackle the issue. True to the museum’s mission and collection, it features many technological objects, but also goes beyond traditional artifacts to include pieces of art, natural objects and even ethnological artifacts. However, one of the main challenges the exhibition curators have faced is the embeddedness of objects in certain places and times. An airplane engine mass-produced in the 1950s can point visitors to the fascinating and far-reaching consequences of high-capacity air travel, the establishment of a global transport network and – maybe – its long-term and grave environmental impacts. 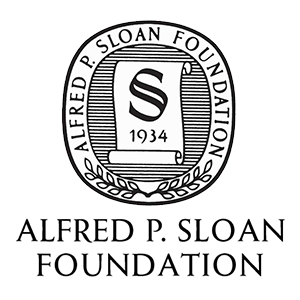 But often the story around the object needs to be told with supplemental tools such as graphics and–too often–lengthy texts. Artifacts are static and situational and may leave different impressions on different visitors. This is what makes them fascinating, but it also constitutes a problem when curating a complex topic like the Anthropocene that is about movement and interdependencies. 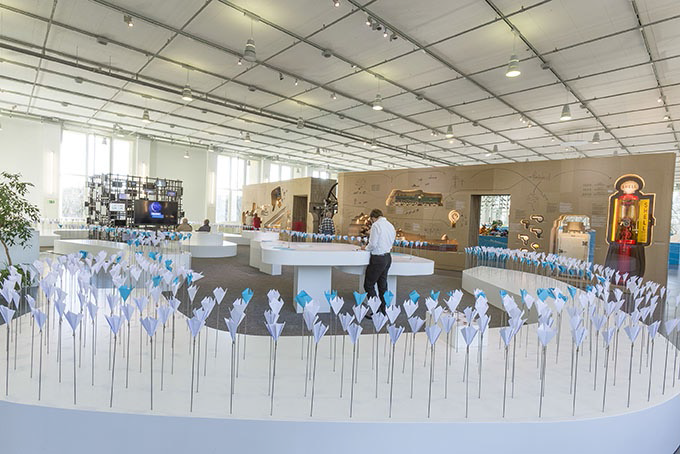 In addition to being more flexible, digital tools have the advantage of longevity: while the temporary exhibition will be dismantled at some point, digital tools can live on and even grow after the exhibition is over. It comes as no surprise therefore that the exhibition curators started early on to think about the integration of digital tools. In addition to being more flexible, digital tools have the advantage of longevity: while the temporary exhibition will be dismantled at some point, digital tools can live on and even grow after the exhibition is over. The three-dimensional exhibition consists of six theme islands next to a large “landscape” that houses the introduction including a large object wall and the participatory element on the future of the Anthropocene. View of the exhibition’s urbanization island with objects and center installation with three scribble films. © 2014 Deutsches Museum. Photograph by Axel Griesch, courtesy of the Deutsches Museum. Digital tools were used in manifold ways in all of these elements, particularly on the six islands composing the core exhibition. In some instances, they help widen the perspective on the Anthropocene. For example, the integration of a media station using the digital material of the Informal City Dialogues by the organization Next City, broadens the focus. By focusing on cities like Chennai, India, or Nairobi, Kenia, urbanization in the Anthropocene is addressed from a less Eurocentric perspective than could have done with artifacts from the museum’s collections alone since these traditionally come from and refer to European contexts. Scribble films’ central installation on the exhibition’s food island. 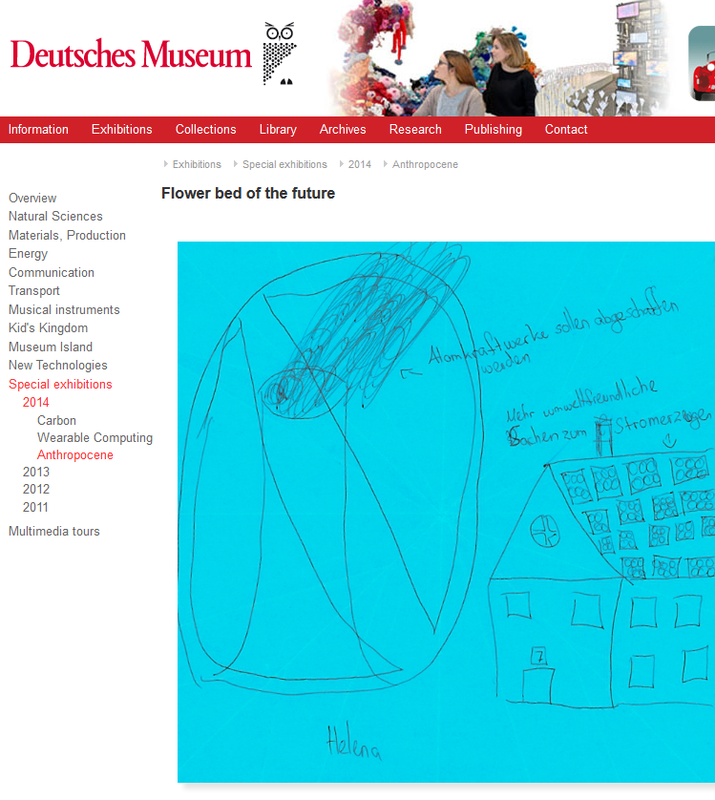 © 2014 Deutsches Museum. Photograph by Axel Griesch, courtesy of the Deutsches Museum. Using existing material as supplement in a museum exhibition is always convenient and the curating team has found it very easy to establish partnerships with organizations that provide online material, but it is not always sufficient to rely on existing material. Particularly with a complex topic such as the Anthropocene, it is also necessary and in fact worth the time and money to conceptualize digital material exclusively for the exhibition. In our case, we’ve concentrated on films as a great way of storytelling to go along with some of the objects that are exhibited. Using a comic-like style, 14 scribble films were developed and put into motion. All of them pick up crucial, but difficult to exhibit phenomena of the Anthropocene. While (historical) objects function as crystallization points in the storyline of urban centers where imputs (e.g., water, money, raw materials) are processed and products, profits or losses, waste etc., are put out, the scribble films highlight the processes themselves and the often incomplete metabolisms and circuits of Anthropocene city life. Excerpt from the Anthropocene Milestones cartoon “The steam engine,” by Marina Porras Chassignet. CC NC-BY-NC-4.0. Environment & Society Portal. The comic-style proved to be a very accessible tool to reach different audiences both in the exhibition itself and online. In addition to the scribble films, short comic strips were developed by a class of illustration art students of the University of the Arts (UdK) in Berlin, putting thirty of the museum’s most well-known objects from the permanent collections into a new Anthropocene context. These comics have proven to be versatile and cross-media elements: They appear on banners next to the objects themselves, serving both as advertisement for the temporary exhibition, but more importantly as a tool to connect the exhibition with the larger and supposedly known permanent collections of the museum. Edited in a separate comic book published alongside the exhibition catalog, the comics offer a fresh and not so serious look on the Anthropocene and last but not least, were published in weekly installments on the RCC’s Environment & Society Portal, they transcend the narrow confines of the physical world of the Deutsches Museum, making them available to a global audience. Exhibition entrance “landscape” with flower bed. © 2014 Deutsches Museum. Photograph by Axel Griesch, courtesy of the Deutsches Museum. Another subject where traditional three-dimensional museum work and digital elements complement each other is technology-based nature protection. In the exhibition, we’ve chosen to focus on the local project of the reintroduction of the northern bald ibis in Europe. In the exhibition, an impressive ibis is accompanied not only with explanatory material such as texts, graphics and images, but also with an App providing online access to live tracking of the migrating birds. The key element of nature conservation efforts in the Anthropocene – the interdependencies between traditional methods and modern technologies like GPS – become much more visible this way. A final example of cross-media work in the exhibition is the flower landscape at the end of the exhibition that gives visitors the opportunity to voice their own opinions on the Anthropocene, particularly their ideas, hopes, fears and wishes for the future. 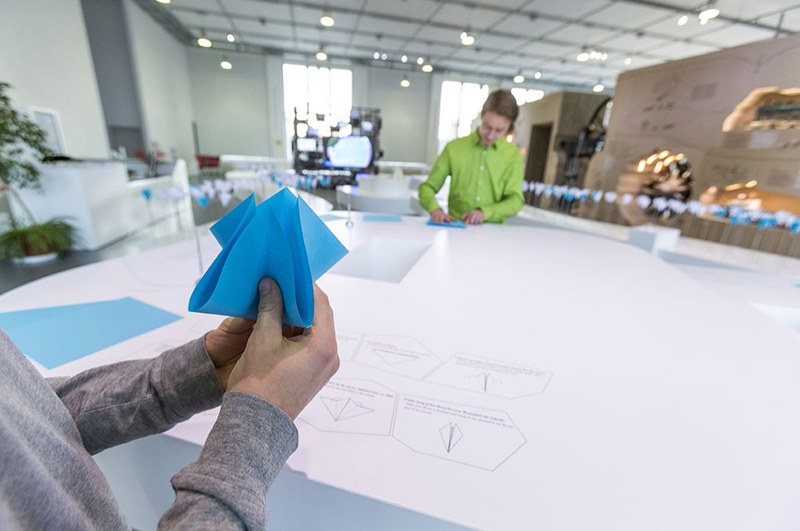 A visitor folds his opinion into an origami flower. © 2014 Deutsches Museum. Photograph by Axel Griesch, courtesy of the Deutsches Museum. By writing down their opinions on a sheet of paper and then folding it as flower to be added to the flower bed, they become part of a wider discussion on the Anthropocene. But the exhibition does not end there: the flowers are periodically “harvested” and published in small booklets for other visitors to view – both onsite in the exhibition and online on the exhibition’s website, therefore allowing for a much larger discussion than usual. Incorporating feedback options on the website will soon allow for a two-way discussion bringing back opinions from the digital world into the three-dimensional exhibition. 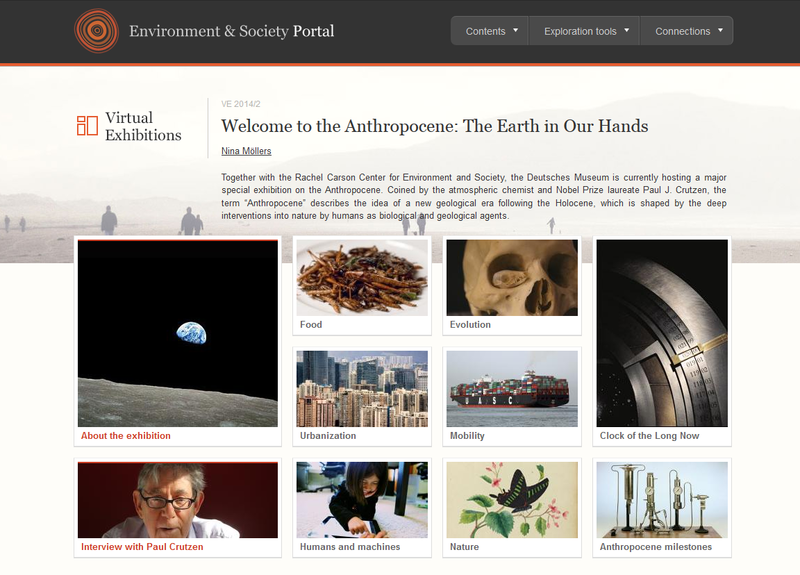 A companion “virtual exhibition” on the Environment & Society Portal further extends the exhibition’s reach. 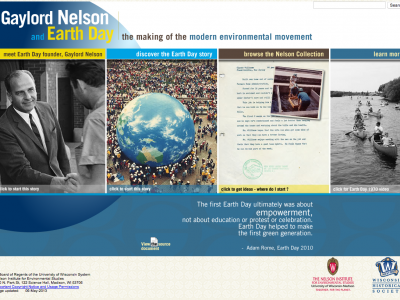 Screenshot of the exhibition’s companion “virtual exhibition” on the Environment & Society Portal. 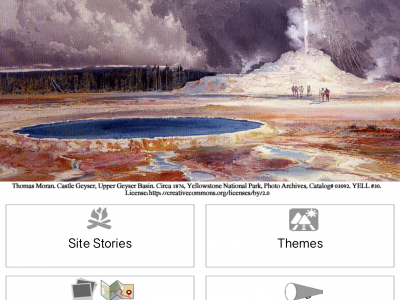 These are just a few examples of how digital tools enhance the Anthropocene exhibition. 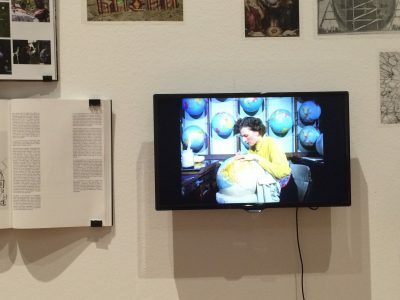 By combining traditional ways of curating with digital projects, the museum as site for reflection and participation has reached a new quality, making it even more relevant for education, but also playful investigation that is so necessary when we tackle the manifold challenges of the Anthropocene earth. 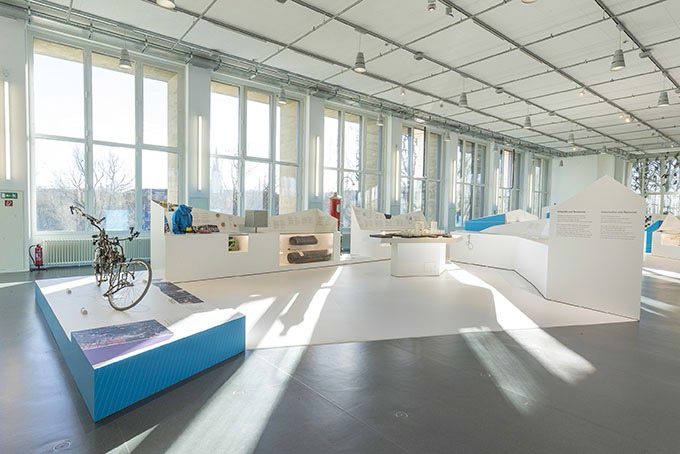 Nina Möllers is project director and curator for the special exhibition “Welcome to the Anthropocene: The Earth in Our Hands,” at the Deutsches Museum, Munich. She holds a Ph.D. in History from the University of Trier.